Biopics are often tributes to eccentrics with grandiose — and often unusual — obsessions. In the case of The Walk, veteran filmmaker Robert Zemeckis (Back to the Future and Forrest Gump) has found a subject with a curious fixation indeed, and while the movie stumbles a bit early on, it (ahem) never falls. The subject here is Phillipe Petit (Joseph Gordon-Levitt), a French daredevil who decided in 1974 that he absolutely had to sneak onto the rooftops of the World Trade Center towers, string a high-wire between them, and then walk across it. Repeatedly. For almost an hour. Petit was the subject of the Academy Award-winning documentary Man on Wire (2008), which focused primarily on the man himself. Zemeckis borrows that film’s heist movie aesthetic, but also widens the scope a bit and throws in a touch of whimsy. The movie opens with Petit/Gordon-Levitt standing on the torch of the Statue of Liberty as the distinctive New York City skyline, Twin Towers included, shine in the background. From this perch, Petit relates the story of his entry into wire walking and ultimate decision to perform his art on the grandest stage imaginable. It’s a framing device that Zemeckis uses throughout the film, albeit judiciously, keeping it playful without running the conceit into the ground. The first half of the film is basic biopic fare, relating Petit’s childhood fascination with tightrope walking, juggling, and street performing; his acquisition of a mentor Papa Rudy (Ben Kingsley); and his meet-cute with young love Annie (Charlotte Le Bon). Zemeckis does his best to perk up the standardized material with some visual and technical flourishes, mainly involving green-screen backgrounds, black-and-white cinematography, and some CGI flair. It’ showoffy, but then so is Petit. Once Petit finds his inspiration in the form of the Twin Towers (which were in the final stages of completion at the time), the movie finds its momentum and becomes more of an adventure. Petit begins organizing “accomplices” for the operation, which he dubs The Coup; they include a mathematician with a fear of heights (César Domboy), an NYC electronics dealer (James Badge Dale), and a couple of sketchy stoners (Ben Schwartz and Jason Deline). Not all the characters register as fully formed, though Dale and Kingsley give strong, stand-out performances. Gordon-Levitt has to carry the film on his own, and he does so remarkably, occasionally verging on hammy (though this is arguably required for the character) and walking a dangerous line with a French accent which he spent a lot of time on. As with the recent Everest, the tension is palpable throughout, even though we know how the story ends. 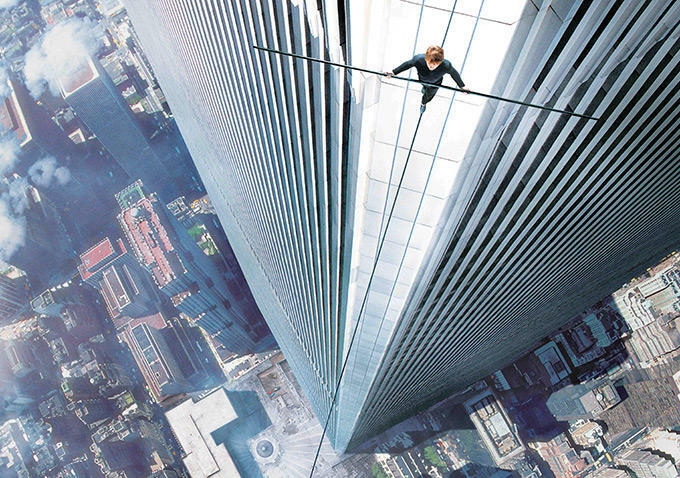 Zemeckis recreated the tops of the Towers via a combination of large soundstage sets and green-screen photography, which allowed him and cinematographer Dariusz Adam Wolski to create some breathtaking, vertigo-inducing images. Petit saw his walk as performance art, and Zemeckis and Gordon-Levitt succeed in finding the poetry in it. For him, and the viewer by extension, it’s an experience verging on an altered state. The Walk is as much a tribute to the Towers themselves, and ultimately the people who built as well as those who lost their lives in them fourteen years ago. The latter hovers over the film like a spectre, and is something that the film silently but powerfully alludes to at its conclusion. however, rather than focus on what was lost, Zemeckis and company choose to remind of the positives: the accomplishment represented in their construction and in Petit’s unique christening of them.